Central venous catheters (CVC) continue to remain a common modality of vascular access in end stage kidney disease patients maintained on hemodialysis. The increased morbidity and mortality associated with CVC, when compared to arteriovenous fistulas and grafts, is a serious health problem and a big challenge to the nephrology community. In this article we present the pros and cons of CVC, in addition to the different complications and excessive economical costs related to their use. Keywords: Central venous catheters, hemodialysis, fibrin sheath, catheter infection, CVC complications, vascular access, tunneled catheters, CVC advantages. Central venous catheters (CVC) are commonly used for performance of hemodialysis (HD). The ready availability of the CVC as a vascular access (VA) for HD often makes them the access of choice, especially when urgent or emergent HD is required either at the time of initiation of renal replacement therapy or when a permanent access becomes dysfunctional. The National Kidney Foundation, Kidney Disease Outcomes Quality Initiative (NKF-KDOQI) Clinical Practice Guideline 8.1.2.2 for Vascular Access recommends that less than 10% of chronic hemodialysis patients be dialyzed using a tunneled dialysis catheter (TDC) . The Fistula First Breakthrough Initiative, which was sponsored by the Centers for Medicaid and Medicare Services and launched in 2004 has similar recommendations . Despite the emphasis on reducing CVC as HD access for prevalent dialysis patients, CVC continue to remain a common modality of VA not only in incident patients, but also for those maintained on chronic HD. CVC for HD are essentially of two types: acute (non-tunneled) catheters and chronic (tunneled) catheters. The acute CVC lacks a subcutaneous cuff and is used only for days to weeks due to the inability to pose a barrier to infection, while the TDC has a subcutaneous cuff and can potentially be used for months to years. CVC remain an important method to obtain VA as a bridge to the placement and maturation of an arteriovenous fistula (AVF) or arteriovenous graft (AVG), pending renal transplantation, and as the sole access in many patients. The use of CVC has several advantages in short term: It does not require the integrity of the peripheral blood vessels, a number of sites are available for immediate insertion, it can be used immediately and for prolonged periods, and it provides painless access. These advantages are listed in Table 1 . Indeed, a ‘catheter conundrum’ remains in existence where we hate catheters, but cannot live without them . Thus, while advantageous in very short term, unavoidable and often necessary, CVC are a hazard in most other situations, especially if used for longer periods. Eggers P, et al. JASN 16; 259A: 2005. Pre-ESRD nephrologist care (column percent), 2007. CVC have a myriad of complications ranging from a minor postoperative bleeding to atrial thrombus, central venous stenosis (CVS) and infections. These complications can be immediate or long-term complications, although some may occur both in the short term and long-term postinsertion periods. Immediate intra-operative and post-operative complications occur in less than 5% of patients. These include bleeding, catheter malposition/kink, vein perforation, carotid or femoral artery puncture/dissection/occlusion, thrombosis, cardiac arrhythmias and reaction to medications. Pneumothorax, hemothorax and hemomediastinum can occur (Fig. 1). These complications can be minimized and managed effectively by an experienced operator having increased awareness and using better technique. The use of ultrasound-guided technique has reduced needle access complications [5-7]. 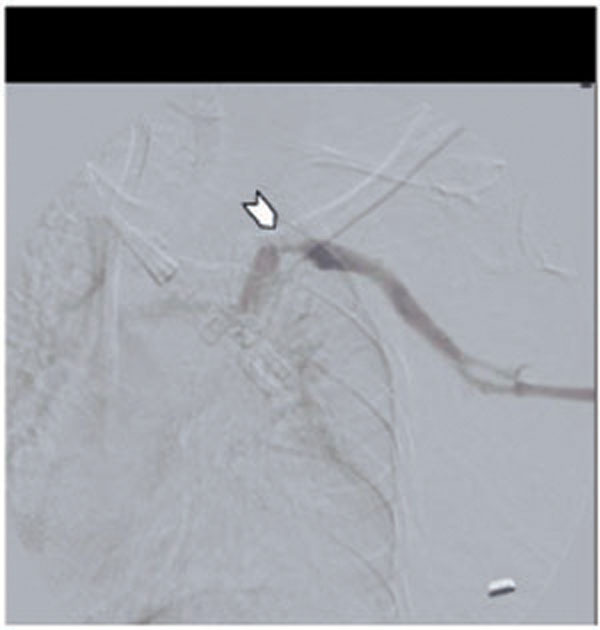 Potentially fatal complication of blood vessel dissection can be minimized by the use of imaging and careful operator technique . The most common long-term complications of HD CVC are related to infection, catheter dysfunction and CVS. These complications are summarized in Table 2. CVC dysfunction is defined by the NKF/DOQI as failure to maintain a blood flow of equal or more than 300 mL/min with a prepump arterial pressure of more than -250 mmHg . Dysfunction may result from either mechanical problems like kinking, catheter malposition, patient positioning or leakage, or thrombotic complications, such as intracatheter thrombosis and fibrin sheath formation. Intracatheter thrombosis, thrombus attached to the tip of the catheter, and intravascular thrombosis remain important causes of catheter dysfunction. Anticoagulant solutions containing heparin and citrate have been typically used to prevent such thrombosis. Various fibrinolytic therapies and mechanical interventions including removal and replacement are commonly employed to treat when such complications occur. 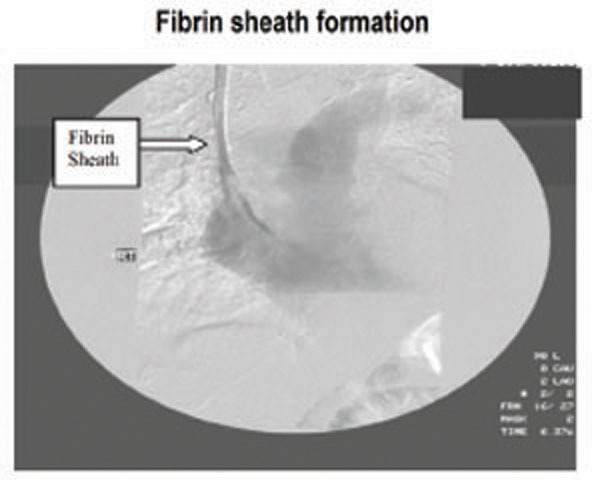 Fibrin sheath formation has been reported in up to 50% of patients with catheter dysfunction . 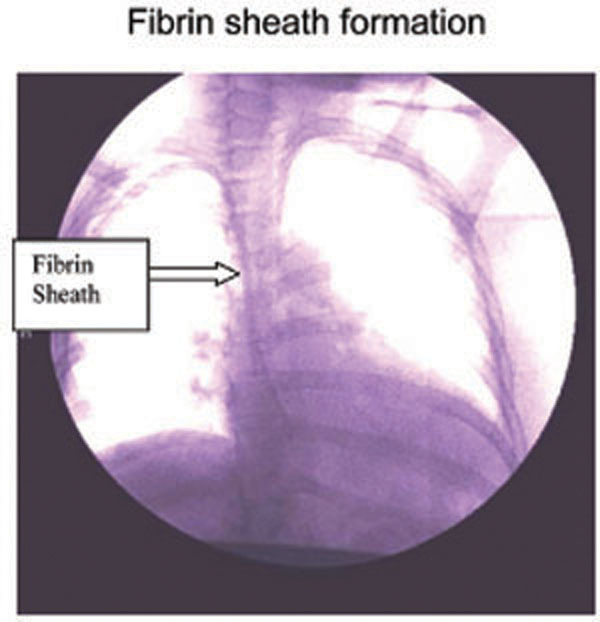 Fibrin sheath originates at the insertion site and migrates down the length of the catheter (Figs. 2, 3). Fibrin sheath can start forming within 24 hours after insertion of TDC and is made from different plasma components including fibrinogen, globulins, albumin and coagulation factors. It may occlude the catheter sideholes or create a vacuum effect resulting in the inability to draw blood, from the catheter. In addition to causing catheter dysfunction, occurrence of thrombosis and fibrin sheath provide media for bacterial colonization and enhance catheter related bacteremia [10-13]. Failure of fibrin sheath detection at the time of catheter exchange may result in the insertion of the new catheter within the “sleeve” of the pre-formed fibrin sheath leading to persistent catheter dysfunction. CVC dysfunction is also defined as the problems with recirculation. Recirculation should be investigated if it exceeds 10% using the urea-based method . It usually results from thrombus formation obstructing the catheter lumen or fibrin sheath formation, which can lead to poor HD adequacy and worsening patient outcome. Thrombolytic therapy is usually the first option to treat thrombotic complications [14, 15]. Endovascular interventions include fibrin sheath stripping, mechanical disruption, endoluminal brushing and catheter exchange over-the-wire. Catheter related infections are common and are responsible for significant morbidity and mortality in HD patients [16, 17]. These infections are classified as exit site infection, tunnel infections, or catheter-related bacteremia (CRB). Exit-site infection is localized to the exit site and does not extend beyond the cuff. It is treated with antimicrobials and usually does not require catheter exchange or creation of a new exit site . Tunnel infection is more serious and involves the catheter tunnel above the catheter cuff. It requires prompt catheter removal in addition to antibiotic therapy. In case of limited access options, catheter exchange with creation of a new tunnel may be an alternative. CRB is defined as positive blood cultures in a patient with a HD catheter and no other source of this bacteremia. The rate of CRB is 3.8-6.6 episodes/1000 days in patients with acute noncuffed catheters and 1.6-5.5 episodes/1000 days in patients with TDC . Metastatic infections including infective endocarditis, osteomyelitis, septic arthritis and spinal abscess are serious life threatening complications of CRB and require aggressive and long-term antibiotic therapy . The association of tunnel infection or the presence of hemodynamic instability in a patient with CRB requires immediate catheter removal and intravenous antibiotic therapy for 3 weeks [4, 20]. In hemodynamically stable patients and in the absence of evidence of tunnel infection, catheter exchange over-the-wire after 48 hours of appropriate intravenous antibiotic therapy is the recommended strategy for CRB. In the presence of an exit site infection the creation of a new tunnel is recommended. HD catheters are known to cause CVS. The interaction of different factors including the presence of CVC within the vessel, turbulence of the blood flow, endothelial injury, uremic milieu and inflammatory response play an essential role in development of CVS [21, 22]. 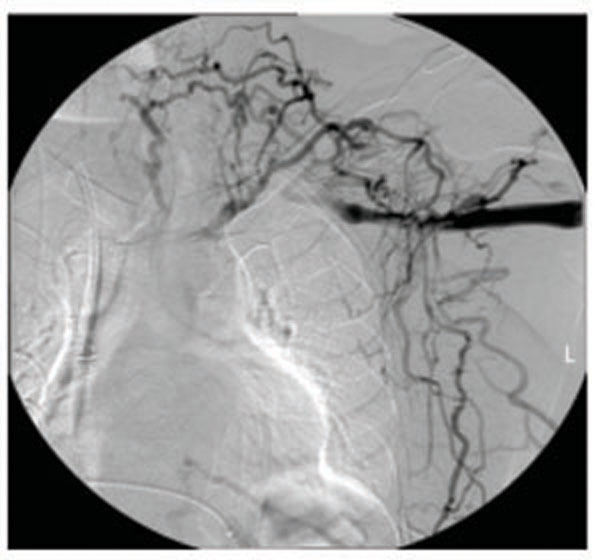 Presence of stenosis can lead to the development of collaterals that can often be visible by physical examination and confirmed by angiography (Figs. 4-6). Clinical features of CVS include ipsilateral extremity edema, breast swelling and pain. 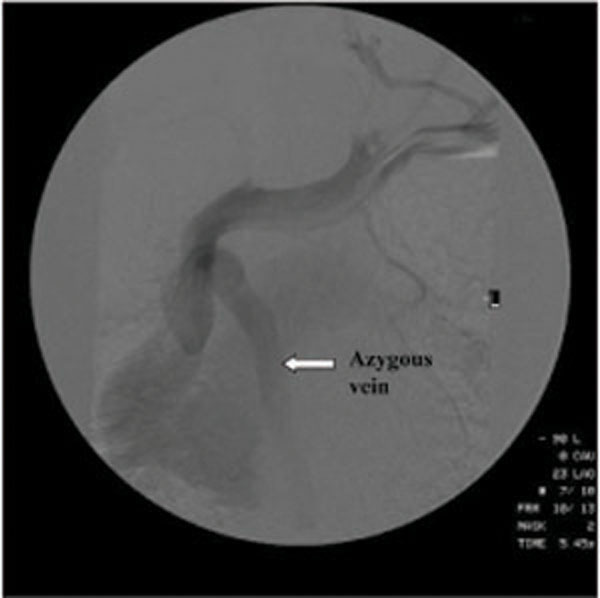 Stenosis or occlusion of superior vena cava may be associated with compensatory dilatation of the azygous vein (Fig. 7). Occlusion of the right subclavian vein with collateral blood flow. Occlusion ot the left subclavian vein with collateral blood flow. Severe left subclavianvein stenosis/left IJ PC. 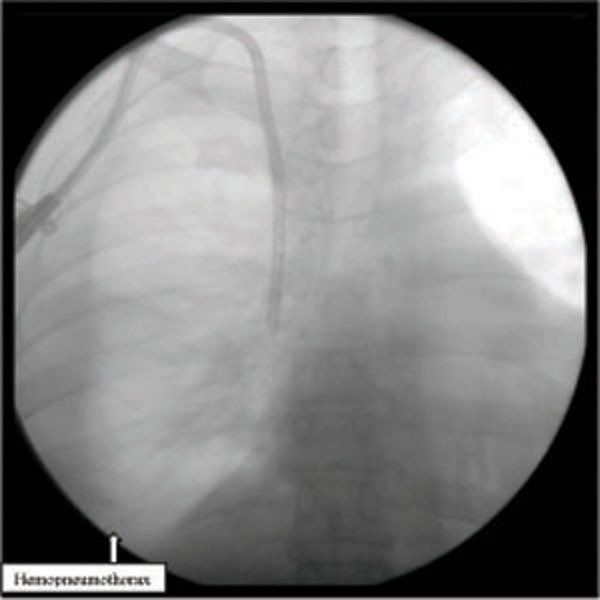 Superior vena cava stenosis due to left internal jugular catheter with dilatation of azygous vein. Subclavian vein catheters are especially likely to be associated with CVS. In one study, there was 40-50% incidence of CVS with use of subclavian catheters [23, 24]. However, internal jugular (IJ) catheters are not benign and a high incidence of CVS is also noted with IJ vein catheters . In a retrospective study of symptomatic HD patients undergoing angiography, 27% of those with a previous history of CVC placement were found to have CVS; most of these patients had IJ catheters . It is also important to note that a high incidence of CVS is associated with peripherally inserted central catheters (PICC), pacemaker and defibrillator wires . Treatment of CVS by endovascular procedures involves angioplasty alone or angioplasty with stent placement. The long-term benefits of the endovascular procedures, although improved with newer technology, remain modest. Surgical options including bypass procedures are indicated in patients with failed percutaneous procedures . Successful combination of both surgical and percutaneous procedures has been reported in some patients . CVS in CKD patients can be prevented by avoiding the indiscriminate use of CVC and PICC. Catheter adherence to the vessel wall may occur when a catheter remains in place for a prolonged period of time. This can be a serious complication if the tip of the catheter adheres to the wall of the right atrium. Surgical intervention is often required for the treatment of such complications. Apart from causing ongoing complications, the CVC in ESRD patients are often associated with worse outcomes. It is well known that the CVC is associated with higher mortality as compared to AVF and AVG. In an early study, a survival advantage was noted with the use of AVF . Similarly, use of CVC is associated with increased mortality when compared with the use of either AVF and AVG. In one study, the annual mortality rates were 11.7% for AVF, 14.2% for AVG, and 16.1% for CVC (Fig. 8) . Prior placement of CVC also seems to impart poor longevity to the subsequently placed permanent access. 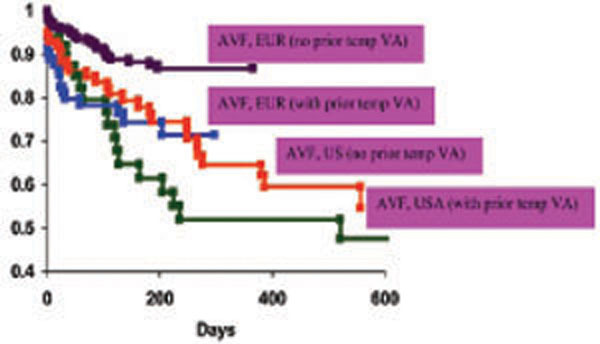 In DOPPS study, both AVF and AVG displayed better survival in patients who had no history of prior CVC placement (Fig. 9) . Impact of dialysis access on survival. (Astor, et al. JASN 60;1449-1455;2005). 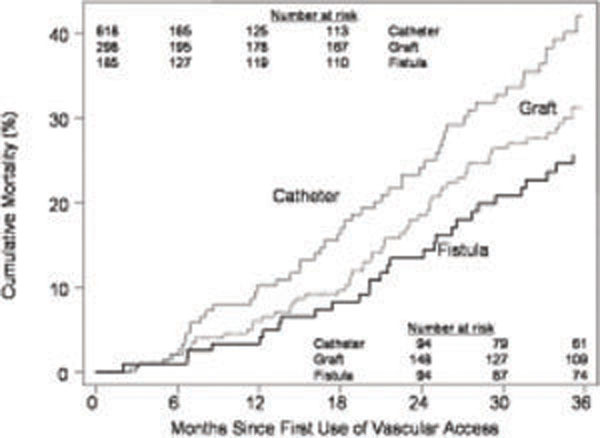 Impact of dialysis catheter as first access on survival of AVF. Adjusted for differences in age, gender, diabetes, peripheral vascular disease, and body mass index; not enough incident patients starting hemodialysis with a temporary catheter to perform this analysis in Japan. (Pisoni RL, et al. Kidney Int 61;305-316:2002). In this era of health care reform, quality of care with cost consciousness has become ever so important. There is evidence to show that use of CVC in ESRD leads to higher costs of care. The relative cost per person per year was found to be an additional $10,000/year in patients with CVC compared to those with AVF or AVG. (Table 3) . Thus, it makes sense to attempt using a VA that carries the least economic cost. A significant number of AVF with primary or secondary failure can be resurrected with use of appropriate interventions in lieu of the use of CVC . It has been convincingly argued that there is a disproportionately high use of CVC for dialysis in the US. 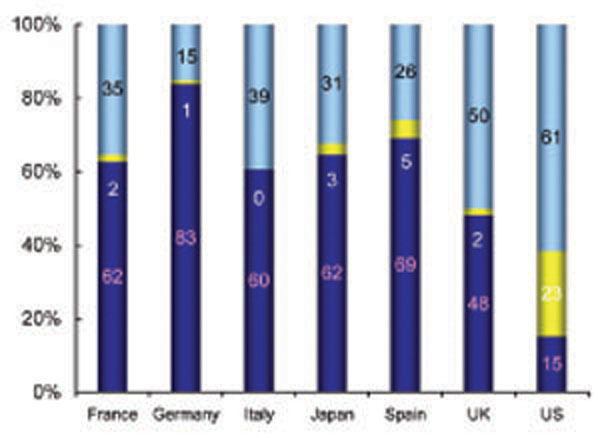 According to the Dialysis Outcomes and Practice Patterns Study (DOPPS), CVC were used as the major type of VA for initiation of HD in the US in comparison to countries in Europe and in Japan (Fig. 10) . 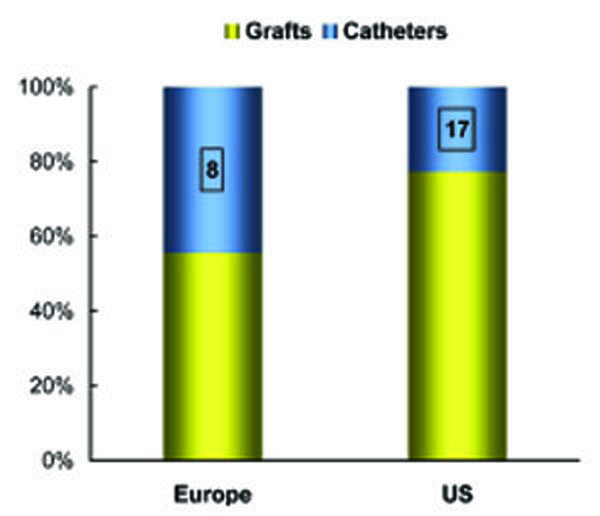 Not only that, twice the number of the prevalent patients in the US were using catheters as compared to European countries (Fig. 11) . It is to be noted that there were insufficient number of patients with catheters in Japan to be included in this analysis. Incident Vascular Access in Europe, Japan and US. The analysis includes patients who entered the DOPPS within 5 days of their first dialysis treatment. Rayner, et al. Kidney Int 63; 323-330, 2003. DOPPS: Data from July 1998-Oct 2000 in prevalent HD patients (145 centers in US and 101 facilities in Europe. Pisoni, etal. Kidney Int 61; 305-316: 2002). The trend in the use of CVC for initiation of HD has not changed much despite the efforts of the dialysis community. As of 2007, approximately 350,000 patients were receiving renal replacement therapy in the US . Of the 91,822 patients starting dialysis in 2007, 75026 (81%) initiated dialysis using a CVC (Tables 4 and 5). Only about 50% of the prevalent patients were using AVF as their VA in 2007. According to the Forum of End Stage Renal Disease Networks, 21% of prevalent patients were using CVC for HD for 90 days or longer. The strategies to reduce CVC need to be implemented urgently. Some of these have been described by the KDOQI guidelines as well as by the Fistula First Breakthrough initiative. There is a lack of pre dialysis care by nephrologists in US and this seems to have an important correlation with the use of catheters as incident access. According to USRDS 2009 report, in year 2007, 43% of ESRD patients were not followed by a nephrologist prior to the initiation of HD . Of these patients, 91% had CVC as their primary access at the time of initiation of HD. In comparison, 55% of incident HD patients, who were followed by a nephrologist for more than 12 months were initially dialyzed with a CVC (Table 6). The early referral to nephrologist by primary care physicians, and an early referral to surgeon for fistula placement by nephrologists are the key interventions to improve incident CVC use. Preoperative vascular mapping can improve fistula placement rates, and perhaps the fistula maturation rates, which has the potential of reducing prevalent CVC rates . For prevalent patients, it would be important to consider placing secondary AVF as a conscious strategy to reduce use of CVC in patients with failing primary access. It has been shown that a significant number of patients using CVC as their access have suitable veins for AVF creation . Special attention should be paid to the patients using TDC on a ‘permanent’ basis, as a significant percentage of these patients tend to have suitable veins for AVF creation . Continual evaluation and patient education regarding their next access is extremely important, as it is a challenge for dialysis staff and nephrologists to convince patients to give up the “ease” of catheter use for the safety and long term benefits of an AVF or AVG. CVC lead to a high level of human suffering and are associated with excessive economical costs. With the steady increase in the number of HD patients and the high prevalence of CVC use in this population, the understanding of catheter-related complications and appropriate management of these complications are essential to improve outcomes and reduce morbidity and associated costs. Use of permanent access, especially the AVF, seems to be the most beneficial and cost-effective strategy. Improving awareness and implementation of the strategies for catheter reduction as well as of the catheter-related complications is of crucial importance to prevent ‘bad’ and ‘ugly’ outcomes of CVC, while taking advantage of their ‘good’ characteristics. K/DOQI clinical practice guidelines for vascular access Am J Kidney Dis 2006; 48: S248-57. Beathard GA: ASDIN Curriculum. Clinton, Mississippi 2008. Schwab SJ, Beathard G. The hemodialysis catheter conundrum: hate living with with them, but can't live without them Kidney Int 1999; 56: 1-17. Forauer AR, Glockner JF. Importance of US Findings in Access Planning during Jugular Vein Hemodialysis Catheter Placements J Vasc Inter Radioo 2000; 11: 233-8. Laméris JS, Post PJ, Zonderland HM, Gerritsen PG, Kappers-Klunne MC, Schütte HE. Percutaneous placement of Hickman catheters: comparison of sonographically guided and blind techniques Am J Roentgenol 1990; 155: 1097-9. NKF-K/DOQI Clinical Practice Guidelines for Vascular Access: update 2000 Am J Kidney Dis 2001; 37: S137-81. Vanherweghem JL, Cabolet P, Dhaene M, et al. Complications related to subclavian catheters for for hemodialysis. Report and review Am J Nephrol 1986; 6: 339-45. Hoshal VLJr, Ause RG, Hoskins PA. Fibrin sleeve formation on indwelling subclavian central venous catheters Arch Surg 1971; 102: 353-8. Mehall JR, Saltzman DA, Jackson RJ, Smith SD. Fibrin sheath enhances central venous catheter infection Crit Care Med 2002; 30: 908-12. Vaudaux P, Pittet D, Haeberli A, et al. Fibronectin is more active than fibrin or fibrinogen in promoting Staphylococcus aureus adherence to inserted intravascular catheters J Infect Dis 1993; 167: 633-41. Crowley AL, Peterson GE, Benjamin DKJr, et al. Venous thrombosis in patients with short- and long-term central venous catheter-associated Staphylococcus aureus bacteremia Crit Care Med 2008; 36: 385-90. Hannah EL, Stevenson KB, Lowder CA, et al. Outbreak of hemodialysis vascular access site infections related to malfunctioning permanent tunneled catheters: making the case for active infection surveillance Infect Control Hosp Epidemiol 2002; 23: 538-41. Haire WD, Atkinson JB, Stephens LC, Kotulak GD. Urokinase vs recombinant tissue plasminogen activator in thrombosed central venous catheters: A double-blinded, randomized trial Thromb Haemost 1994; 72: 543-7. Haire WD, Deicher SR, Mullane KM, et al. Recombinant urokinase for restoration of patency in occluded central venous access devices. A double-blind, placebo-controlled trial Thromb Haemost 2004; 92: 575-82. Saxena AK, Panhotra BR, Al-Mulhim AS. Vascular access related infections in hemodialysis patients Saudi J Kidney Dis Transpl 2005; 16: 46-71. Inrig JK, Reed SD, Szczech LA, et al. Relationship between clinical outcomes and vascular access type among hemodialysis patients with Staphylococcus aureus bacteremia Clin J Am Soc Nephrol 2006; 1: 518-24. Beathard A, Urbanes A. Infection associated with tunneled hemodialysis catheters Semin Dial 2008; 21: 528-38. Fernández-Cean J, Alvarez A, Burguez S, Baldovinos G, Larre-Borges P, Cha M. Infective endocarditis in chronic haemodialysis: two treatment strategies Nephrol Dial Transplant 2002; 17: 2226-30. Beathard GA. Management of bacteremia associated with tunneled hemodialysis catheters J Am Soc Nephrol 1999; 10: 1045-9. Agarwal AK, Patel BM, Haddad NJ. Central vein stenosis: a nephrologist's perspective Semin Dial 2007; 20: 53-62. Agarwal AK. Central Vein Stenosis Current Concepts Adv Chronic Kid Dis 2009; 16: 360-70. Schwab SJ, Quarles LD, Middleton JP, Cohan RH, Saeed M, Dennis VW. Hemodialysis-associated subclavian vein stenosis Kidney Int 1988; 33: 1156-9. Barrett N, Spencer S, McIvor J, Brown EA. Subclavian stenosis: a major complication of subclavian dialysis catheters Nephrol Dial Transplant 1988; 3: 423-5. Jassal SV, Pierratos A, Roscoe JM. Venous stenosis and thrombosis associated with the use of internal jugular vein catheters for hemodialysis ASAIO J 1999; 45: 356-9. Agarwal AK, Patel BM, Farhan NJ. Central venous stenosis in hemodialysis patients is a common complication of ipsilateral central vein catheterization J Am Soc Nephrol 2004; 15: 368-9. Shemesh D, Olsha O, Berelowitz D, Zaghal I, Goldin I, Zigelman C. Intra-operative central vein angioplasty during arteriovenous access creation J Vasc Access 2005; 6: 187-91. Dhingra RK, Young EW, Hulbert-Shearon TE, Leavey SF, Port FK. Type of vascular access and mortality in U.S. hemodialysis patients Kidney Int 2001; 60: 1443-51. Brad CA, Joseph AE, Neil RP, Michael JK, Nancy EF, Josef C. Type of Vascular Access and Survival among Incident Hemodialysis Patients: The Choices for Healthy Outcomes in Caring for ESRD (CHOICE) Study J Am Soc Nephrol 2005; 16: 1449-55. Pisoni. Ronald L, Young EW, et al. J Vascular access use in Europe and the United States: Results from the DOPPS Kidney Int 2002; 61: 305-16. Eggers PW, Chen S, Ebben JP, Collins AJ. Fistula is the least expensive form of vascular access in terms of total medicare expenditures J Am Soc Nephrol 2005; 16: 259A. 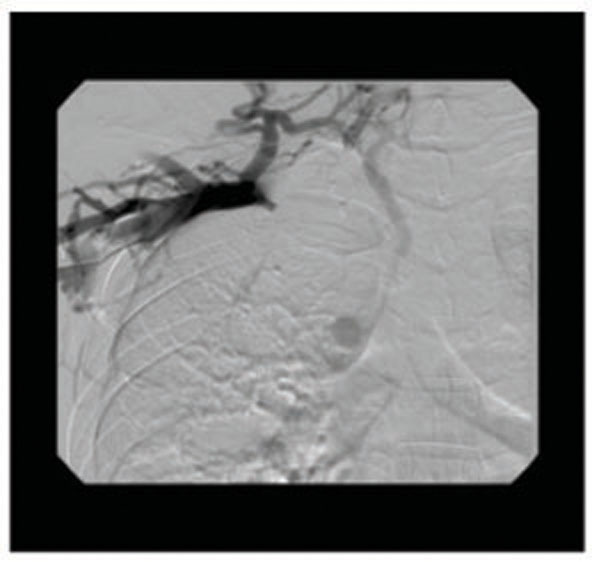 Beathard GA. Strategy for maximizing the use of arteriovenous fistulae Semin Dial 2000; 13: 291-6. Rayner HC, Pisoni RL, Gillespie BW, et al. Creation, cannulation and survival of arteriovenous fistulae: data from the Dialysis Outcomes and Practice Patterns Study Kidney Int 2003; 63: 323-0. Pisoni RL, Young EW, Dykstra DM, et al. Vascular access use in Europe and the United States: Results from the DOPPS Kidney Int 2002; 61: 305-16. Silva MBJr, Hobson RW2nd, Pappas PJ, et al. A strategy for increasing use of autogenous hemodialysis access procedures: impact of preoperative noninvasive evaluation J Vasc Surg 1998; 27: 302-8. Asif A, Unger SW, Briones P, et al. Creation of secondary arteriovenous fistulas: maximizing fistulas in prevalent hemodialysis patients Full Semin Dial 2005; 18: 420-. Asif A, Cherla G, Merrill D, Cipleu CD, Briones P, Pennell P, et al. Conversion of tunneled hemodialysis catheter-consigned patients to arteriovenous fistula Kidney Int 2005; 67: 2399-406.